What was the meaning of the bronze serpent? Jesus Himself tells us. This most comforting of Bible verses with its promise for all now has a beautiful melody for its setting. Beloved by children and musicians, this is an old Irish tune. "Have I not commanded you? Be strong and courageous!" We all could do with this reminder frequently! ...from the domain of darkness. This song is from one of my favorite Bible verses, Colossians 1:13. We were once trapped in the realm of death, but Christ delivered us. From the book of Zechariah come these verses about the Lord gathering His people from the east and from the west. At that time, when the Lord returns to Zion, children will play in the streets, and old men and women will sit with their staffs in the streets of Jerusalem. This song mentions prophecies about the Messiah, who would become the Passover Lamb and then be resurrected, the reason we celebrate Easter. This Bible verse song has very much the feeling of a cowboy or western song, because of the "boogie" sound of the left hand. 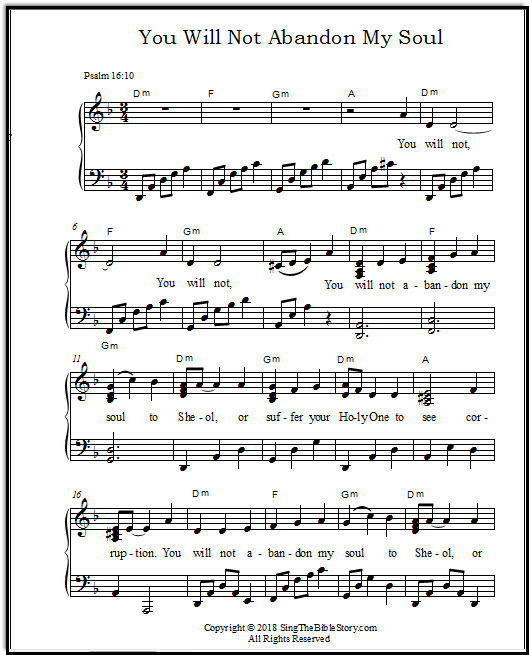 Your Sunday School kids are likely to find this song easy to sing! There is a message of salvation, a prophecy, hidden in the meaning of the names of Jesus's first ten grandfathers. From Adam to Noah, read what they signify! Micah 5:2 - This is the prophecy that the priests and scribes quoted to wicked King Herod when he demanded to know where the Christ was to be born. This is a beautiful song, highlighting the exciting description of the Messiah as one who is "from old, from everlasting!" "Trust in the Lord with all your heart, and lean not unto thine own understanding." This comforting psalm speaks about the Christ not being left in the grave. It also speaks of us, God's human children, not being abandoned. God gives us to know that the grave is not the end.